SerialMailer is the bulk mailer that cares about privacy. It lets you add personalized details to your mass email messages while keeping all your recipient lists locally on your computer. Give each message a custom name, order number, or even attachment. Engage your customers and colleagues, or show your friends and family that you care – when it comes to bulk email messages, a touch of personality goes a long way! The mail for each recipient is sent on its own, just as if you had manually composed a new mail for each of your contacts. An easy to use editor allows you to create formatted messages with images, tables and lists. For more complex tasks you can create your own design templates or import websites. SerialMailer's email personalization goes beyond just pasting fields from your recipient list. You can use conditional fields to adjust greetings and even adjust which attachments are sent. The addresses from your macOS Contacts App are automatically available in SerialMailer. In addition to that, you can import your lists from text files, Excel tables or from your website. Use any number of custom fields and create as many independent lists as you like. 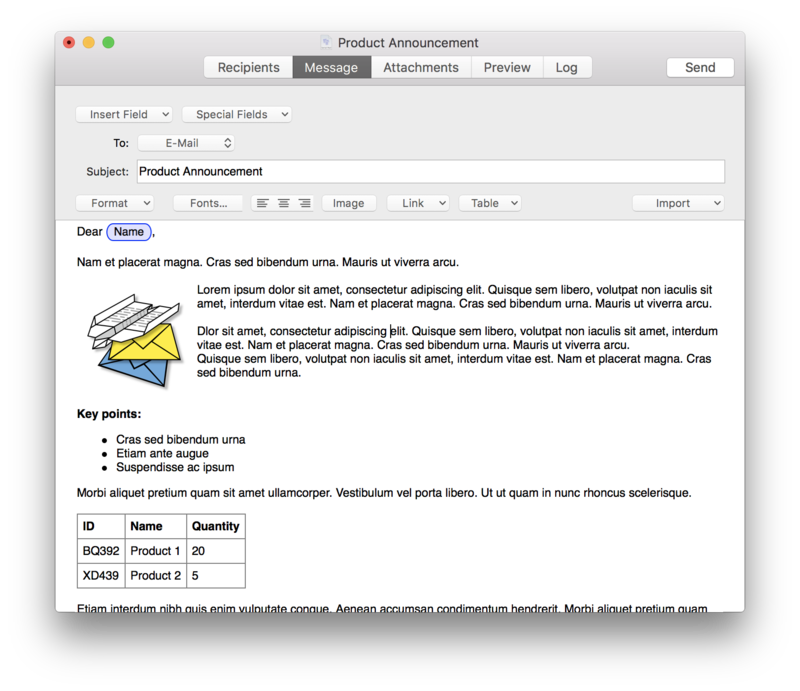 Import the contacts for your next newsletter from various sources and formats such as the Apple AddressBook, Text/CSV files from spreadsheet or database software, Excel (.xlsx), vCard files or other SerialMailer documents. SerialMailer can detect duplicated addresses. The recipient list of a mail document can be filtered based on many different criteria. Personalize the message text by inserting fields from the database. Advanced formatting, with images, tables and lists. Design Templates: Create a consistent design for your mails and reuse it with just a few clicks. SerialMailer can import html from webpages or rtf files. SerialMailer acts just like a normal Email client and can use any SMTP Email account. Send plain text messages through Apple Mail, no further configuration needed. Send speed throttling to not overwhelm your email server. Blacklisting of email addresses (use wildcards to block entire domains). Feel free to contact us, we are always looking for feedback and new ideas to improve our software.